Primary intraorbital fungal lesions are relatively rare and may masquerade as other entities. Aspergillosis belongs to the category of systemic mycoses. Though rare in immunocompetent individuals, there is an increased incidence of invasive aspergillosis in the immunocompromised patients, and its incidence has only increased over the past two decades Orbital fungal involvement is worrisome because of ready availability of pathways for further intracranial spread, such as superior orbital fissure, optic canal that directly open into the middle cranial fossa. Although fungal involvement of the orbit extending from the sinuses are quite frequent, a true orbital fungal granuloma is less so. Here we report a case of isolated retro-orbital fungal granuloma involving a rare fungal species. 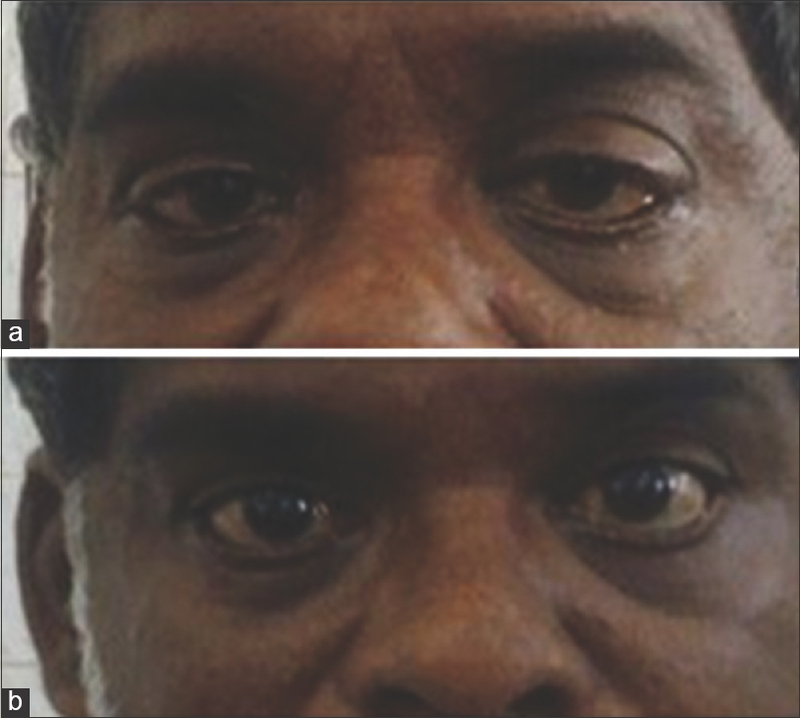 A 52 year old male was referred to the Outpatient Department of the Department of Otorhinolaryngology of a tertiary care centre with complaints of protrusion of left eye associated with pain in the left eye and watering of the left eye for six months duration. The symptoms were slowly progressive, but at the time of presentation the patient complained of electric shock – like pain in the eye. He had no co-morbidities and had no history of trauma or surgery or any previous treatment for the condition. General examination of the patient was grossly normal. Examination of the left eye showed axial proptosis [Figure 1]a, with no pulsations and no increase with Valsalva maoeuvre. The conjunctiva, cornea, anterior chamber, iris, pupil and lens were all normal. The orbital margins were free with no obvious palpable mass. Fundus examination revealed blurring of the nasal disc margin. Extraocular movements were unaffected and visual acuity was normal. The right eye was grossly normal on examination. Examination of the nose and paranasal sinuses was normal, and no obvious mass was detected on anterior rhinoscopy. Examination of the ears and throat were normal. Diagnostic nasal endoscopy revealed an irregular pinkish proliferative mass medial to the middle turbinate, which did not bleed on touch and was insensitive to touch [Figure 2]a. Plain computed tomography (CT) of the orbits (axial view) was done and showed a retrobulbar intraconal lesion in the left orbit, probably arising from the inferior rectus muscle, which extended into the posterior aspect of the nasal cavity through the medial wall. The paransal sinuses were free of disease [Figure 2]b. Under local anaesthesia, a biopsy was taken from the nasal mass and histopathology revealed features of chronic non-specific inflammation. Considering a possible diagnosis of pseudotumour, the patient was started on oral methylprednisolone, but there was no improvement in signs even after two weeks of treatment. A pulmonology opinion was sought, but there was no systemic evidence of tuberculosis. In view of non-improvement of symptoms, the patient was taken up for endoscopic exploration under general anaesthesia. Left uncinectomy, anterior and posterior ethmoidectomy and sphenoidotomy was done. Lamina papyracea was opened and removed and close to the orbital apex 5-6 mL of pus was drained and the same was collected and sent for culture and sensitivity, Ziehl-Nielson staining, Gram staining and KOH mount. Following this, optic nerve decompression was done and the intraorbital mass was carefully debulked which was found to be friable tissue. Gram staining, Ziehl-Nielson staining were negative for organisms and KOH mount did not reveal any fungal elements. Culture on Sabaraoud's dextrose agar grew Aspergillus species. Slide culture [Figure 2]c revealed reduced Penicillium-like structures with fully covered vesicles and the presence of Hülle cells [Figure 2]d and [Figure 2]e, features consistent with Aspergillus versicolor, a rare species to be found intra-orbitally. The postoperative period was uneventful and the patient was started on Oral itraconazole 100mg twice daily and over the course of two months the left eye proptosis reduced significantly [Figure 1]b. Review at 2 years postoperatively did not reveal any recurrence of symptoms. Aspergillus species are ubiquitous, commonly found in the soil and decaying vegetation. The spores are typically inhaled or ingested without consequence in the normal host and exposure to this fungus is frequent, yet disease due to tissue invasion is uncommon in the immunocompetent host. The portals of entry for Aspergillus include the respiratory tract, damaged skin or other operative wounds, the cornea and the ear. An intact immune system can prevent the disease in a healthy individual and the mechanism of an isolated retro-orbital fungal infection in an immunocompetent individual is quite mysterious. Aspergillosis is the second most frequently seen fungal infection of the face and mouth in patients receiving chemotherapy. It is second to Candida in its frequency. Aspergillosis of head and neck region, primarily affects the nasal cavity and paranasal sinuses. Aspergillus as a pathogen cannot actively penetrate undamaged and intact mucus membrane or skin as it lacks keratolytic enzymes. Rarely has invasive Aspergillus infection been described in immunocompetent patients. Orbital involvement in invasive aspergillosis in known to occur by contiguous spread of the disease from paranasal sinuses either by expansion or bone erosion due to pressure effect of the polyps or by fungal tissue invasion. Early diagnosis of intraorbital fungal infection remains a challenge. 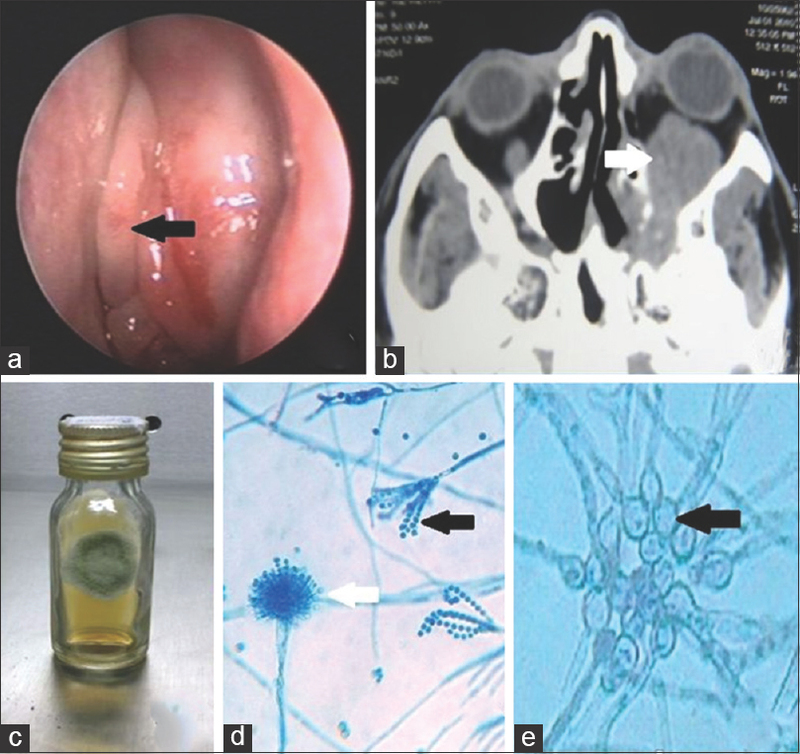 The presentation of orbital aspergillosis can mimic diseases like mucormycosis, neoplasms, vascular aetiology and neuro-ophthalmic diseases. Aspergillus versicolor is a cosmopolitan fungus often found in damp indoor environments. It commonly causes onychomycosis, otomycosis, cutaneous disease, osteomyelitis and pulmonary infections. There are rare reports of endophthalmitis and epicorneal aspergilloma caused by this organism. But there are no reports of retro-orbital fungal granuloma caused by Aspergillus versicolor. Colonies of Aspergillus versicolor are variously colored (versicolored) and range from very pale green to greenish-beige, pinkish-green or dark green. The fungal hyphae are septate and hyaline and the vesicles are small, with metulae and phialides covering most of the vesicle. Reduced conidial structures resembling those seen in Penicillium species are common and globose Hülle cells may also be present. Intravenously administered conventional amphotericin B is often used for the treatment of infections by Aspergillus versicolor. But conventional amphotericin B has reduced bioavailability; therefore, intravenous liposomal amphotericin B and intravitreal amphotericin B are preferred. Recently, A. versicolor has been shown to be resistant to amphotericin B and there have also been reports of treatment failure. Alternatively, oral itraconazole has good activity against A. versicolor, but its effectiveness is limited by its reduced bioavailability. Voriconazole, a second-generation triazole, has very good bioavailability and is active against A. versicolor and other Aspergillus species and is currently the drug of choice for the treatment of invasive aspergillosis. Successful treatment of aspergillosis requires prompt diagnosis and rapid institution of therapy, because delay or nonaggressive therapy can result in the spread of infection with lethal consequences. Radiological imaging is an extremely important diagnostic modality in these types of lesions in both making a diagnosis and in directing treatment. Endoscopic clearance of the disease combined with oral antigfungals appears to be the appropriate modality of therapy. Sivak-Callcott JA, Livesley N, Nugent RA, Rasmussen SL, Saeed P, Rootman J, et al. Localised invasive sino-orbital aspergillosis: Characteristic features. Br J Ophthalmol 2004;88:681-7. Neeli AS, Kotrashetti SM, Vallavan P. Sino-orbital aspergillosis: A case report and brief review of literature. World J Dent 2012;3:363-6. Fuqua TH Jr., Sittitavornwong S, Knoll M, Said-Al-Naief N. Primary invasive oral aspergillosis: An updated literature review. J Oral Maxillofac Surg 2010;68:2557-63. Denning DW. Invasive aspergillosis. Clin Infect Dis 1998;26:781-803. Lin SJ, Schranz J, Teutsch SM. Aspergillosis case-fatality rate: Systematic review of the literature. Clin Infect Dis 2001;32:358-66. Peterson SW. Phylogenetic relationships is Aspergillus basedon rDNA sequence analysis. In: Samson RA, Pitt JI, editors. Integration of Modern Taxonomic Methods for Penicilliumand Aspergillus Classification. Amsterdam, the Netherlands: Harwood Scientific Publishers; 2000. p. 323-55. Richardson MD. Aspergillus and Penicillium species. In: Ajello L, Hay R, editors. Topley & Wilson's Microbiology and Microbial Infections. 9th ed. Vol. 4. London, England: Edward Arnold; 1998. p. 281-312. Liu Z, Hou T, Shen Q, Liao W, Xu H. Osteomyelitis of sacral spine caused by Aspergillus versicolor with neurologic deficits. Chin Med J (Engl) 1995;108:472-5. Primary orbital aspergilloma of the exenterated orbit in an immunocompromised patient. Indian J Med Micro 2006;24:233-4.